In this article we will demonstrate seven simple REST client examples involving sending a GET request to an HTTP-based API using an API key for authentication. We will present examples demonstrating NodeJS, Python, Ruby, PHP, and Perl. Even if you’re not a DreamFactory user (you should check it out, our OSS version is available for free download) there’s still plenty to learn from this post! Format your JSON into something a little more human readable. Validate that the JSON is in correct format as described by the JSON spec. If for any reason the JSON isn’t valid you will be given a hint as to what steps to take to correctly format your JSON. As with before, you’ll receive a lengthy JSON response in return. However this time it was accomplished with a lot less code with the added bonus of formatted JSON! As with the other examples, if everything is configured properly you’ll see the JSON returned in the script output. Boom! So there you have it, 7 quick and easy scripts to GET and parse data from the DreamFactory REST API. 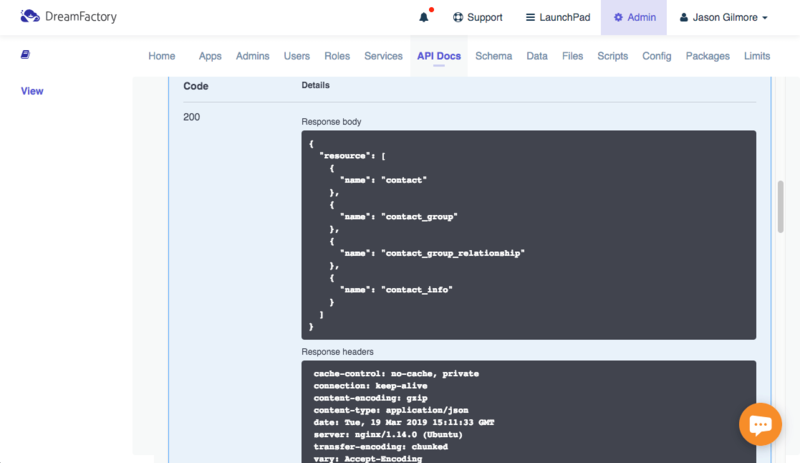 Something else you may have noticed is that the API endpoint was used over and over again in each of the client calls without requiring a single line of server-side code, awesome! If there is a topic you’d like us to cover feel free to tweet us @dfsoftwareinc and let us know! We would love to hear from you!